Xidi Village was built during the Northern Song Dynasty (960-1127). At that time, people lived together based on clanship and consanguinity. Xidi was occupied by the Hu clan. There are more than 300 buildings in Xidi, which were mainly built during the Ming (1368-1644) and Qing (1644-1911) Dynasties, among which there are 124 residential houses and three Ancestral Halls1 that have been preserved in their original state. The layout of Xidi is well designed. It looks like a sailing boat. Most of the houses are composed of three rooms and a square yard. The presence of elaborate brick-sculpture, woodcut and stone carvings on these ancient residences make them typical examples of the Hui style of architecture. Walking into any of these houses, you will find art everywhere. Stone carvings of flowers, birds and beasts are usually on the doorframe. Brick carvings and woodcuts decorate the windows. 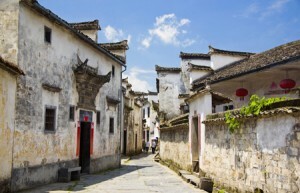 As a famous village in Huizhou, Xidi was once occupied by many rich Hui merchants. They wanted to build luxury houses to show off their wealth. But the strict hierarchy of society had restrictions on construction which specifically affected people of a lower social class. So the merchants were only able to choose the best materials and utilize the most sophisticated workmanship when building their place of residence. The memorial archway—built in 1578 by Hu Wenguang, who was a high-ranking official during the Ming Dynasty—is a good representation of the Hui-style of stone carving. The best example of Hui brick sculpture is in the house of another Ming official, which is in a place called the West Garden. Xidi is considered to be at its most beautiful in the spring. The fields outside the village are covered in yellow canola flowers and there are hundreds of peach trees in the village, which all blossom together in April. Ancestral Hall: It is a kind of temple where families can worship their ancestors.